The Radio Disney Music Awards will be airing live on the Disney Channel this Sunday, April 27th at 8pm. However, Disney is throwing a viewing party at the Stadium Theaters at The Shops at Dos Lagos with a pre-party starting at 6pm. 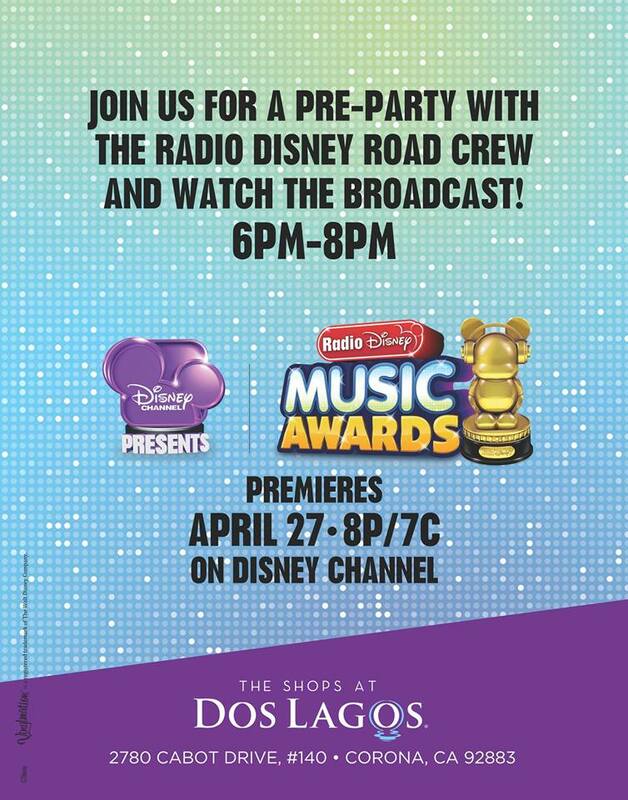 The Radio Disney road crew will be there to pre-party with music, games, prizes, and a make and take “ARDY award” craft. The doors will open at 7:30 pm and the show will go from 8– 9:00 pm. The Radio Disney Music Awards are the only awards show geared towards kids and families! They have graciously extended an invitation to the members of our region. Please note that the capacity is at 392 persons and attendees will be on a first come, first served basis. And if you can’t make it out to Corona, don’t forget to check out all the fun on Disney Channel! Previous Previous post: GOLD AWARD SPOTLIGHT: Brooke’s “Girls 4 Girls” club!